To get students reflecting more closely on sources, it is a good idea to get the class to anticipate what they are going to say before showing them. The method by which this can be done with textual sources is the subject of this post. With statistics, this can be done in the form of a quiz where students get a score based on how closely they correctly guessed the correct figures. To do this, present students with a list of questions which will have statistics as their answers. After they have guessed the correct statistic for each question, students should be told the correct answer for the first question. They then calculate the difference between their guess, and the correct answer. This process is repeated for the other questions. Students are then asked to add up the sum total of the figures in the ‘difference’ column to gain an overall score to determine an overall class winner. Case Study 1: How popular was appeasement on the eve of World War Two? The example show here was used at the end of a study of the Causes of World War Two and the reasons for appeasement. 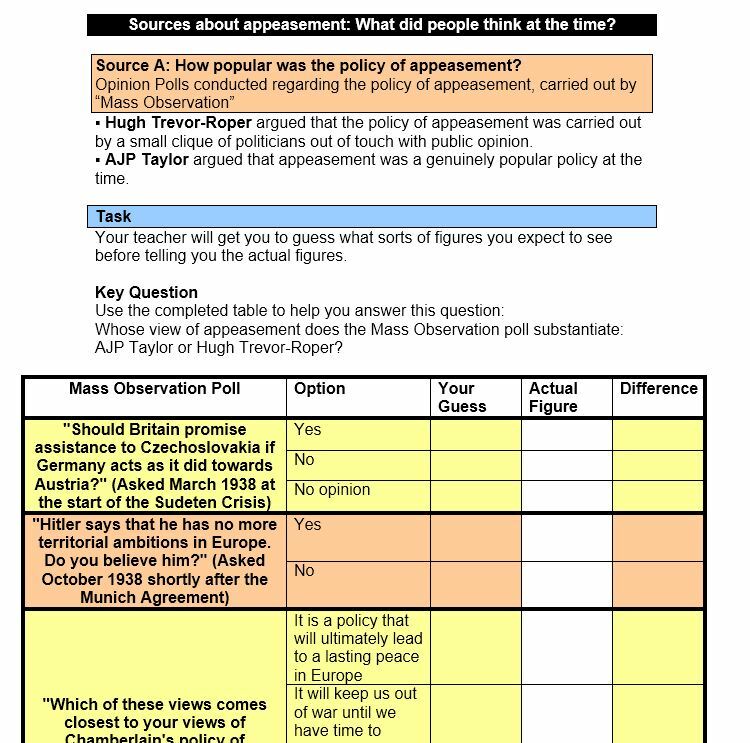 It is a particularly effective way to help students determine how much popularity the policy of appeasement enjoyed with the British public. It is particularly worthwhile after completing the exercise to ask students which results particularly surprised them, and discuss why they were unexpected given their contextual knowledge; other students who guessed these same statistics more accurately could use their background knowledge to argue the opposite position. Case Study 2: How revolutionary was the Industrial Revolution? This example provides a particularly good illustration of following up one of these exercises with a debrief aiming to provide an explanation for the statistics in question. Starting with ‘Population’, I ask the class to have a guess what the figure will be in 1750 before telling them the correct answer (11 million). Then, working with a partner, they have to guess what the figure will be in 1900. I start by asking them to decide first whether the number will go up, or down, compared to 1750. Then, they need to decide after discussion with their partner what they guess will be the answer, and why. This process is repeated for the other points in the list (the issue of public health – will it improve, or degenerate? – tends to divide opinion quite drastically and changes scores pretty suddenly, so I leave this one till last to build up some tension). At the end of the exercise, instruct students to stand up as soon as they have calculated their overall score. Once the whole class is standing, count downwards from a high number in increments of ten or more as appropriate, and instruct students to sit down when the number announced is lower than their own score. The last person left standing is the overall winner and could be asked to explain how they reached their deductions on each of the answers they provided. 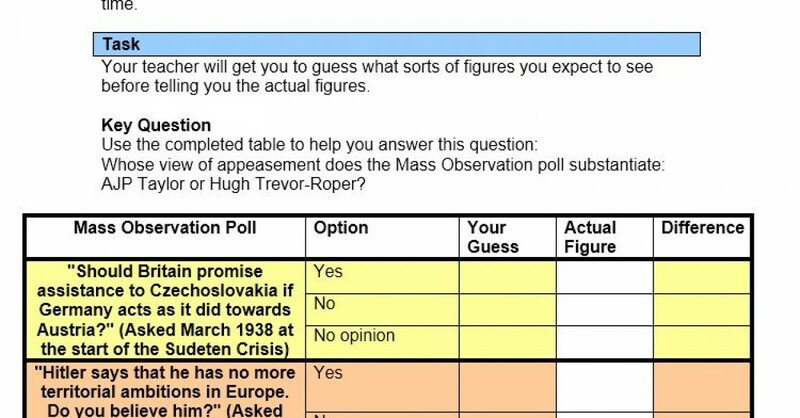 After completing the ‘quiz’ element of this activity, ensure that students are given time to write a full answer which tries to explain the statistics in question rather than merely describe them (“What was the attitude of the British public towards appeasement? How do explain this?”, “What changed during the Industrial Revolution, and why?”).